According to a report form The Jerusalem Post, a senior official at the White House confirmed that Kushner, a key figure in the peace plan efforts and also Trump’s son-in-law, would participate in a discussion on the Israel-Palestinian peace process with leaders from other nations. The Palestinians, who have repeatedly rejected Trump’s anticipated peace proposal despite not having seen the final version, called the Warsaw conference an “American conspiracy” intended to pressure others on the Palestinian situation. The comments released by the Palestinian Ministry of Foreign Affairs and Expatriates, and included in a report by the Ma’an News Agency, claimed the Trump government had “declared war” on the Palestinian front and they would ignore any results from the Warsaw conference. A separate report from Ma’an quoted Secretary General of the Palestinian Liberation Organization (PLO) Executive Committee, Saeb Erekat—who has previously acted as a key negotiator with Israel—as clearly stating their intention not to attend the conference. Israeli leader Netanyahu, meanwhile, was already discussing on Sunday his plans and whom he intends to meet during the two-day conference, which begins on Wednesday. While in Warsaw, Netanyahu will meet with US Vice President Mike Pence and US Secretary of State Mike Pompeo. 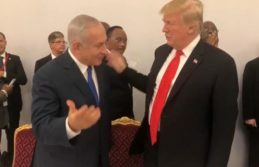 However, in the comments released by his office, Netanyahu did not touch on the Israel-Palestinian peace process as a topic of discussion. Instead, he focused on the Iranian threat. The press release said the event would address terrorism, missile proliferation, proxy groups in the region and more. The Israel-Palestinian peace plan was not explicitly mentioned in this initial event promotion, which was published on January 11.